I would like to take a moment and thank Linda for allowing me to post her wonderful recipe. I like to doctor up cake mixes. 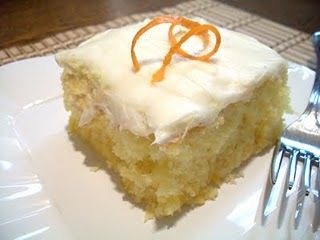 The mandarin orange keeps the cake moist and flavorful. This cake would be great for any occasion. Easter right around the corner. This would be a great dessert on any table. Well my friends, I have a few people asking me when I am going in the kitchen and make dinner. I have some hungry folks on my hands. I think tonight will be clean out the refrigerator. I have some leftovers that need to be eaten before they go bad. Preheat oven to 350 degrees. In large bowl, pour 1 can mandarin oranges with juice. Drain remaining can of oranges, add to bowl. Add cake mix, eggs, and oil. Mix well. Pour batter into greased 13x9 inch baking pan. Bake 35 to 40 minutes. Cool. Frost with cream cheese frosting or whipped topping. Enjoy! Just saw your post on twitter. Love this light, refreshing cake, Christine! It will be so perfect for Easter, as well. Yumm! BTW-I would like to pay forward the awards I received. I have a previous long list from January but will not do another long list, so I'm letting you know personally. You deserve the award! Congratulations! Oh my gosh! What a terrific idea. I love the mandarin orange flavor and the pretty twist on top. Nice recipe it looks very moist and congrats on your award. Hi Christine, my first time stopping by, you have a great blog! I will definitely visit again and marking up this great looking cake for Easter menu! Welcome! I stopped by your site. Nice site. Your coffee cake would go great with a cup of coffee. Looking forward to sharing! Oh yum! This would be great for a dinner party or easter meal...it looks so easy and so good! Thank you for sharing your sweet self with me tonight. I always know I can find something delicious and uplifting when I visit. I hope you have a safe and happy Sunday. Good morning, I just made a version of that cake as well. It is so good. Thanks for visiting @ Moms Sunday Cafe. I love this idea! I like my cake with a bit of fruit. It makes it moist and tasty. 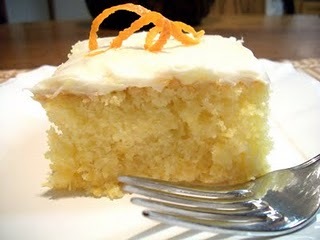 I prefer orange flavors over lemon and lime any day so this cake is perfect for me - is that candied orange peel - did you mention that and I missed it? This cake looks so moist, and I love the light orange flavor. This is perfect for Spring or Mother's Day! The orange peel on top is just plain orange peel but I prefer to use the candied. Thanks for stopping by. Not only does this sounds incredible, but your picture of the cake is just beautiful! I love the orange peel on top, yum! 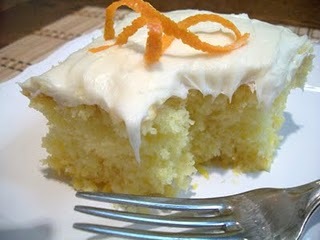 I adore citrus anything...and this cake is so moist and delicious-looking! That cake sounds so refreshing any time! I love doctored mixes, too. Looks so light and fluffy! Great photos. I love the orange in this vanilla cake a lot, it must taste great! Hi Christine! I love mandarin oranges and wow this recipe is so easy! Even I'm not a baker, I think I can make this. My daughter LOVES mandarin oranges so we always have them at home. Thank you for sharing. I like how you put the zest on top. It's pretty! I'm making this cake right now for our Mother's Day celebration! I adore mandarin oranges and with a cake mix it makes this a pretty easy-to-whip-up dessert idea. I made this yesterday for Mother's Day and it was a hit. The only change I made was that I used a lemon cake mix (I didn't have a vanilla mix and thought that the lemon would add more citrus flavour anyway). It was great! I also used an Orange Cream Cheese icing to top it all off. Delicious!